For it to take effect, the pact must be ratified by national legislatures throughout the 12-country bloc, where individual industries have vigorously lobbied to protect their products from foreign imports or to open up export possibilities for trade in other countries. The completion of the deal is a major foreign policy victory for President Barack Obama, even though congressional approval of the deal is uncertain, with lawmakers unlikely to consider it until next year. He said the accord "reflects America's values and gives our workers the fair shot at success they deserve." Numerous economic analysts see the deal as an agreement that could counter the growth and influence of China, with the world's second largest economy. It is not part of the pact, but even as Beijing's economy has slowed, it still has wide trading impact throughout the world. Obama said that "when more than 95 percent of our potential customers live outside our borders, we can't let countries like China write the rules of the global economy. We should write those rules, opening new markets to American products while setting high standards for protecting workers and preserving our environment." Japanese Prime Minister Shinzo Abe called the agreement "a farsighted policy for all participating countries that share the values and try to build a free and fair economic zone." The president campaigned for the trade pact over the opposition of most of his Democratic colleagues in Congress, who say the deal will cost thousands of U.S. workers their jobs as manufacturers move their operations to other countries where workers are paid less. Conversely, business-oriented Republicans who oppose a wide range of Obama's domestic and foreign policies, mostly have favored completion of the trade pact. One key Republican lawmaker, however, Congressman Paul Ryan — his party's 2012 vice-presidential candidate — took a cautious stance on the completion of the agreement. "A successful Trans-Pacific Partnership would mean greater American influence in the world and more good jobs at home," he said. "But only a good agreement — and one that meets congressional guidelines in the newly enacted Trade Promotion Authority — will be able to pass the House. I am reserving judgment until I am able to review the final text and consult with my colleagues and my constituents." In the United States, final approval of the deal could be complicated by the looming 2016 presidential election, and congressional action on the accord ultimately could be put off until 2017, when a new president takes office. Obama is constitutionally barred from seeking a third term. Negotiators engaged in five days of talks in Atlanta to complete the deal, compromising on the last disagreements over intellectual property protection for new biologic drugs, automotive assembly rules and dairy product trading. One of the final disputes involved Australia and the United States, over the length of patent protection for manufacturers of biologic drugs against generic imitators. The U.S. wanted 12 years of patent protection, but in the end agreed to at least five years of protection for drug manufacturers and possibly up to eight. In a dairy production deal, Canada and Japan agreed to increase access to their markets, while the Americans decided to let New Zealand send more of its milk products into the U.S. 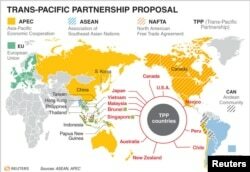 The other countries covered by Monday's agreement are Mexico, Peru, Chile, Vietnam, Brunei, Singapore and Malaysia.